Award ceremonies tend to favour the serious over the light-hearted, angst over humour, the weighty over the breezy. There may be many reasons for this, not least perhaps being a caution at being seen as intellectually inferior by honouring that which is lighter in tone. If, however, the theory is correct that comedy and tragedy are but a heartbeat apart, then any biased by various awards bodies is all the more ignorant. Consider Shakespeare, for instance: Much Ado About Nothing and Romeo And Juliet have more or less identical plots, with marriage ceremonies conducted in secret, the underhand assistance of a member of the clergy and a faked death. The former’s only a more-or-less literal heartbeat away from the latter. Reading or viewing the two together inevitably deepens the experience, casting fresh light on characters and turnings of plot in both. Sam Mendes isn’t Shakespeare, but it seems to me that he’s up to something of a similar nature. Revolutionary Road is the domestic chamber piece recast as an All-American tragedy, where the death of dreams is equally as tragic as loss of a loved one. His latest, Away We Go is another close-up portrait of another All-American relationship, but of a sweeter, apple-pie, flavour. Others come into the couple’s orbit: in this one on the point of the birth of their first child as against the previous film’s house purchase. They are both couples let down – the one by the suburban dream, the other by people. One couple spins helplessly and inevitably towards tragedy; while the couple at the centre of Away We Go bumble agreeably along, discovering that they’re the only really sane ones in a world that’s gone mad since they moved out to the sticks to be near the in-laws. As always with a Mendes-helmed film there’s much to like – the cinematography, the performances, the script (especially as this one’s from married couple Dave Eggars and Vendela Vida, a kind of post-modern literary celeb-couple). Among the supporting cast there are some great moments as a variety of fine actors ply their trade – most memorably for me, Allison Janney. Taken separately these characters are fine; all together and there’s a danger of weirdness-indigestion, they’re existence and purpose being to highlight the sane-ness of the central couple. It is, though, the central couple who save it. I’ve heard it said that this film is for those with children, who will recognise various staging posts in that life transition; many without children have found this smug or alienating, Maybe. My wife and I, though, don’t have children and are fine with that. My overriding impression (my wife hasn’t seen it yet) was not of smugness but rather the cool refreshment of a central couple who are relationally healthy and emotionally balanced. We need more like them. In the context of the film, that may have required some over-egging of the profile of the supporting cast, but no matter. Thinking now of the all too real relationships I recognised in Revolutionary Road, it makes me both cry and laugh all the more. The more I think, the more I wonder if Sam Mendes really is the poet our times need. An old story goes that if you throw a frog (I’ve never worked out why you would, but bear with me) into a pan of boiling water, then it will jump straight back out. By contrast, if you place said unfortunate in a pan of cold water that’s slowly heated up from below, it won’t notice, and it will slowly die. I have no idea if this is true, as I have both a shortage of frogs and shortage of inclination to test the theory. It’s meant to illustrate the way problems born of the environment we are in day by day can slowly creep up on us, and ultimately dominate us without us ever realising. 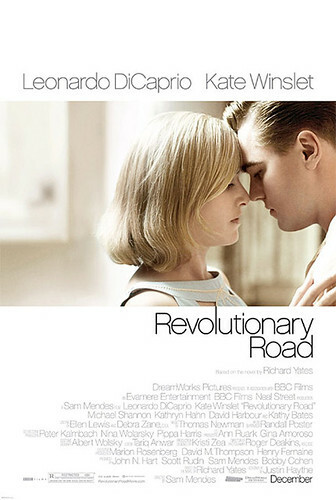 In this analogy, Revolutionary Road gives us Kate and Leo as Frank & April – their marriage is the frog, the comfort of suburban life is the slowly bubbling pan. The film has the same outsider’s penetrating eye for what’s really going on as did the same director’s American Beauty. This isn’t quite in the same league – thanks mainly to an unnecessary and poorly written ‘wise-fool’ character in the form of the son of their neighbours. He’s on day release from the local psychiatric hospital, ad predictably he’s the only one who really sees what’s going on. That aside, this is an all too telling and painfully real tale. Couples who settle into safety as soon as they have children, who dream of doing something different but who end up slowly suffocated by the expectations of everyone they know. It would be easy to dismiss this as simply depressing, but it’s more than that. This is, for some, the price of having children – using duty to them to paper over the cracks, to pretend this really is what they wanted. All the while that disappointment and disillusion has to go somewhere – and it goes on sly comments, witholding of affection and settling for calm co-existence at the price of doing the hard work that will lead to genuine break-through. The film, then, takes this principle and spins it out to its logical (dramatised) conclusion. It’s not perfect – I’d like to have seen more on how this effects the children, who turn up so rarely that I kept forgetting about them. It is, though, to be roundly praised for it’s bravery in taking on the suburban dream so dear to this film’s target audience. I’ve heard many people say the film looks depressing and predictable – that it’s a turn off. That may be – but maybe because it’s so real. It should be required viewing for couples planning their future.